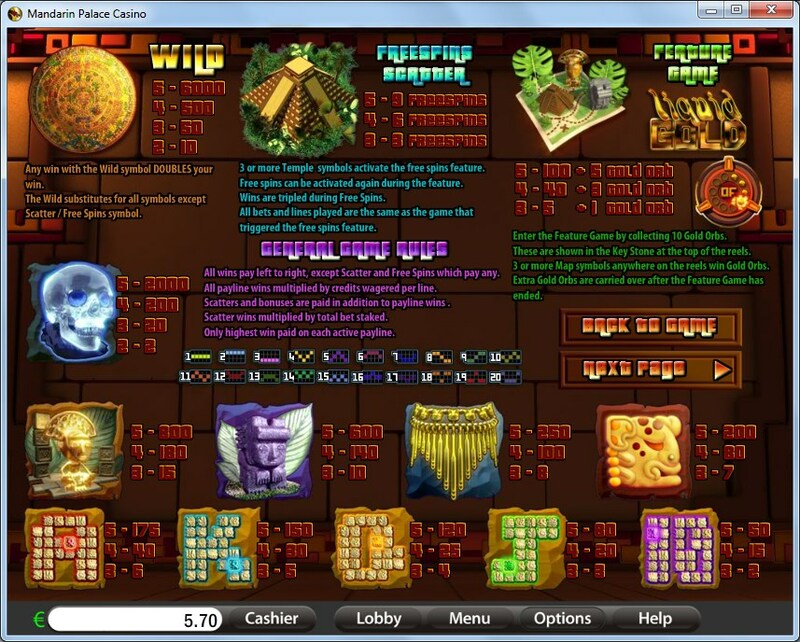 Coming from Saucify, City of Gold is a slot machine themed around South American ancient civilizations, long lost now, but which have left behind temples, golden idols and plenty of other treasures. That’s at least the theme of the game, and it seems to be something that developers from all over the world have a small obsession with. 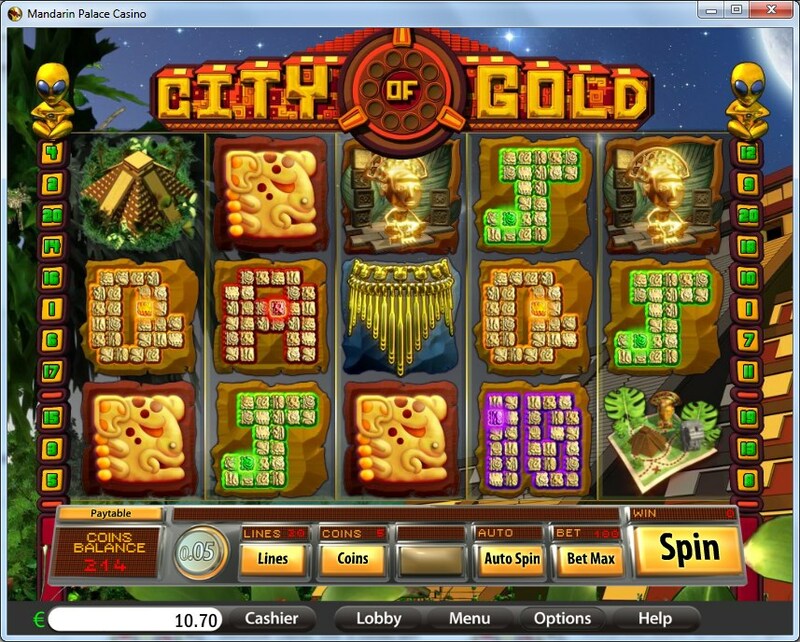 The Incas, Mayans and the Aztecs have gotten more slot machines than I can even remember, and City of Gold is one of them. 20 bet lines are part of the game, using 5 reels to support them. Free games, bonus features, scatters, multipliers and a wild are on offer, plus a $7,500 jackpot. You can take advantage of a wild symbol which applies a multiplier, of a couple of scatters, a bonus game and of free spins with multipliers of their own. The symbol chosen to represent the wild seems to be some kind of round shield, filled with decorations and drawings. It’s a beautiful object, and you will get to see it from time to time, when it makes appearances and it tries to act as a substitute for the symbols which are needed. If you’re lucky, it will land somewhere where it can be of help, and if a new combo forms with its help you will get double the usual payout from it. It’s also useful when it lands and forms its own combinations, since it pays the biggest amounts available in this slot. Up to 6,000x is offered by a combo formed out of wilds only. One of the two scatter symbols is the one with the Temple on it, square shaped and looking like a pyramid. This is the trigger of the free spins, which will give you 3, 6 or 9 rounds, for 3, 4 or 5 Temples, respectively. The free spins have tripled wins for all combinations formed. You can retrigger them as well, with another 3+ Temples. A second scatter exists in the slot, and its image is that of the Ancient Village Map. It will do two things for you, both of them when you have a minimum of three such symbols in random locations. You get prizes between 5x and 100x the total bet, and then you also get some Gold Orbs which you collect. For 3, 4 or 5 scattered Village Map icons, you will receive 1, 3 or 5 Gold Orbs, respectively. Once you’ve collected 10 Gold Orbs, you will gain access to the bonus game. If you play the game with all the lines active, you will need to wager at least 20 coins, but you can go as high as 100 coins, where each line gets 5 of them. Coin denominations ranging from $0.01 to $0.25, you can bet up to $1.25 per line, or $25 total. The slot pays 6,000 times the line bet, which in this game would mean 30,000 coins. With the highest denomination selected, it’s a $7,500 prize. The design is the one you would expect, with idols, temples, jewelry and all sorts of other gold made objects visible on the reels. The riches that are left behind by this ancient civilization are visible everywhere you look, and even the poker cards look like they’re made out of small precious stones. 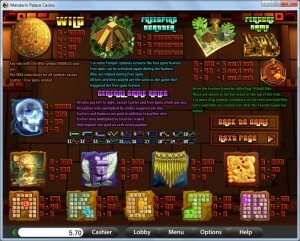 The design is good enough, but it’s comparable to what you get from many of the slots which have a similar theme. Symbols: Round Shield (6,000x, wild), Temple (scatter), Village Map (scatter, 100x bet), Skull (2,000x), Gold Idol (800x), Stone Idol (600x), Gold Necklace (250x), Idol Decoration (200x), Ace (175x), King (150x), Queen (120x), Jack (80x) and 10 (50x). I for one am not a big fan of these games, since I’ve seen so many slots with South American civilization themes, but if you don’t mind then it’s going to be a decent title to play. 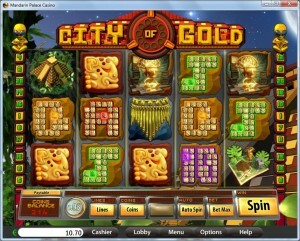 This City of Gold slot is offered by all online casinos with Saucify/BetOnSoft software, playable either in practice or in real money mode.